Does God really mean that young children be left orphans, old parents and grandparents abandoned by their able children, husbands and wives part ways, all possessions big and small deserted, and everyone else preaching the Gospel bare-footed and naked? Certainly not! Did not our heavenly Father send Jesus to give up everything including His very own life so we may be delivered, live in peace and live life at its fullest (John 10:10)? How then can He just ask us to give up all these that He has freely given? Jesus here is showing what it would take to be His real disciples. He has bought us with His own precious life. This makes following Him as a disciple in the making, not a cheap stuff that can be easily grabbed by anyone from the drive-through of famous fast food chains with just a few coins. Truly following Jesus will not be a walk in the park either. His words meant that in order to follow Him, we must learn to let go of our attachment from everything we have. God is talking about allegiance and loyalty because where your treasure is, there your heart will be also (Matthew 6:21). Although He does not mean to take away from us everything we have instantly, we must always be willing to give up anything if we are to choose between following Him or this world. This makes up a true and a loyal disciple. Perhaps, many rich or even not so rich “Christians” are giving two thumbs up when someone says that this verse should not be taken literally. They would be jumping with a sigh of relief. But, what if God says it should? What would your stand be? “Look carefully then how you walk, not as unwise but as wise, making the best use of the time because the days are evil. Every second that passes is a second that is gone forever. The Scripture teaches us to use our time wisely by making the best out of it. It can be read in the book of Genesis that when the earth became corrupt and violent, God decided to put an end to all people by destroying it and everything in it. It will be destroyed by the great flood. Noah was given clear instructions by God to build an ark with specific dimensions (Genesis 6:13-16). He was commanded to bring into the ark pairs of living creatures including his family so they will live with him when the floods will come. God cautioned Noah that in seven days, He will send the rain for forty days and forty nights and that all living creatures on earth will be wiped out (Genesis 7:4). Today, every one of us is a living proof that Noah had not wasted time in building the ark. It is not explicitly written in the Bible but some scholars say it took him near or about a few years lesser than a hundred to build it and he finished it on time. More importantly, he followed God’s commandment to have the pairs of living creatures including his family settle inside the ark. Noah respected God’s time and made sure that everything was in order. Otherwise, our ancestors (i.e. Noah and his family) did not make it and not even one of us is here today. Thanks to Noah’s diligence and respect in God’s time! He made it into the ark in seven and not in eight days or so! Jesus is coming soon! 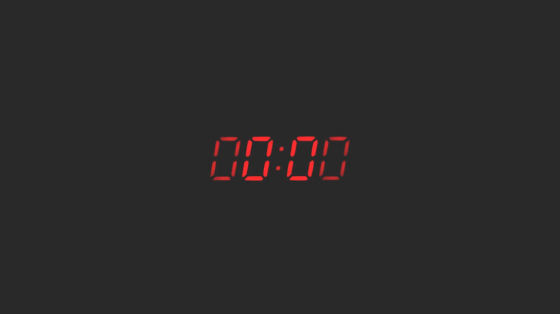 We are running out of time. It is not good enough that we are assured of our personal salvation only. Let us use whatever time is left to bring others to Jesus too. Jesus did not give us the Great Commission for nothing. Use your time wisely and share the good news of salvation! And while we are still living here on earth, we should keep in mind that tardiness is being disrespectful of other people’s time. It is a sign of selfishness. It is not what the scriptures teach us. We are being taught to spend our time wisely. That way, we will get things done and we will get there on time! The next time you commit to getting things done within a deadline or the next time you promised to be in a place on a specific time, refuse to be late. Think about the “Great Flood” that you may be caught into if you’re late! Much have been written and said about faith and how it works in our Christian life. It is defined and described in so many ways, with each definition reflecting the very essence of its meaning. So what is faith? 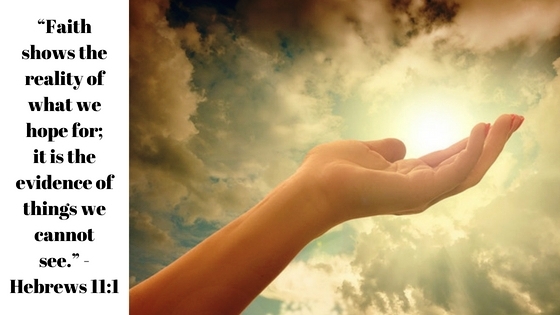 How does the Bible define faith and what is the importance of faith in the Christian life? Christians are blessed to have the precise definition of faith in the Bible, the written word of God. Although the authorship of the book of Hebrews is still in question, the fact that it was established as canonical gives it the same authority as the other books in the Bible have. On one hand, the world defines faith as a firm belief in something for which there is no proof (ref: Webster dictionary). It is believing on something that we are not sure of because of lack or non-existence of any evidence to back-up the belief. On the other-hand, in spirituality, (ref: Genuine Faith: The Faith that Saves), faith in God rests upon the best evidence, the infallible Word of God. The author goes further to describe that faith impels loving obedience and good works. However, most popularly defined in the Bible, faith is having the things hoped for happened, the evidence of things that we do not see (Hebrews 11:1). Contrary to what the world says, Christian faith, is a firm belief in God; not without proof but is undeniably founded on the unerring, incomparable richness of the living Word of God, which is the Holy Bible. Faith comes from hearing the message and the message is heard through the words about Christ (Romans 10:17). If faith comes from hearing the message, then as Christians, we should not hesitate to share the message whenever we have the chance to do so. While it is true that a deeper study about the Bible, the life and deity of Jesus Christ is highly recommendable in sharing the message, it is however not an excuse not to share the good news even if we neither have a bachelor’s, a master’s nor a doctorate degree in theology, or studies of divinity. Apostle Paul teaches us that we do not need to be eloquently relying purely on acquired wisdom of man to share the gospel but by the guidance and anointing of the Holy Spirit (1 Corinthians 2:4-5). Genuine faith is rooted on the powerful Word of God. The Word that has been given to us to be used for teaching, rebuking, correction and training (2 Timothy 3:16). 1) We receive salvation by grace through faith. Our Christian life began the moment we received Jesus as our personal Savior. This confirms our salvation by His grace which we have received through faith (Ephesians 2:8-9). While salvation is precisely a (free) gift from God by His grace, faith, the channel to which salvation abounds is in the part of man. It is our response to God’s invitation of salvation. We can never please God without faith Hebrews 11:6) and without faith, we cannot receive the best gift that God has prepared for us. It is further written that faith without good deeds is dead (James 2:26). Good works are a result of our faith and the fruits of salvation. Sadly, in the lives of many people, despite hearing and witnessing the love and wonderful works of Jesus in their personal lives, it is still very difficult for them to truly believe and put their total confidence on Him. In the bible, Jesus has spent three years with His disciples. They were able to see Him face to face and personally interacted with Him. Yet, when He appeared to them after His resurrection, one of His disciples (Thomas) couldn’t even believe that He came back to life until he saw Jesus’ nail-pierced hands. He needed to see Jesus’ nail-pierced hands and put his finger on His wounds to believe (John 20:24-29). We, the Christians after the life of Jesus here on earth, are blessed because we have not seen Him yet we believed. This has all started once in our life when we have heard the message about Christ, believed in His infallible words, and believed on His promises as they unfold right before our own eyes in our daily lives. We continue in our walk with Christ, looking forward to the salvation that we will experience in heaven which is yet to come based on His promises. 2) Through faith, we overcome the world that leads to a fruitful life. Jesus has overcome the world when He died on the cross so that we may live. He has risen back from the dead for us. We should not be taking this greatest sacrifice for granted. He has won the victory with a price so that whoever believes shall overcome (1 John 5:4-5). We can overcome all the things of this world; all the works of the devil through our faith in Jesus (1 John 2:16). The devil has already been defeated and has no more authority on us, for Jesus has paid the ransom with His own flesh and blood. We need not wait for heaven to experience victory in our lives for it is God’s purpose that we be blessed with a victorious life even we are still here on earth. He wants to bless us so that we can live life abundantly (John 10:10). 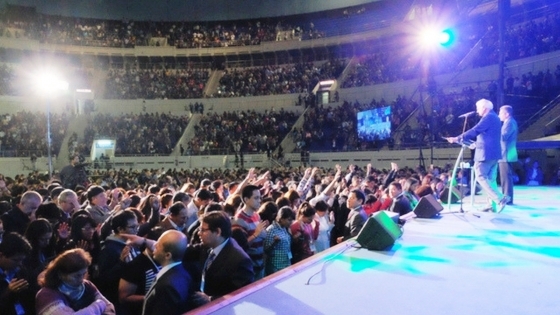 *Related Article: What is the victorious Christian life? He has come to prepare everything for us and He wanted us to remain in Him, our faith to be rooted on His words that brings life, that through our trust and confidence in Him, we shall never fail to bear fruits in season (John 15:5; Jeremiah 17:7-8). 3) We overcome trials through faith. In 1 Corinthians 10:13, we learn that each of us shall go through trials and temptations that are common to man. God allows these trials to come our way so that through all these trials, we are pressed closer to Jesus. 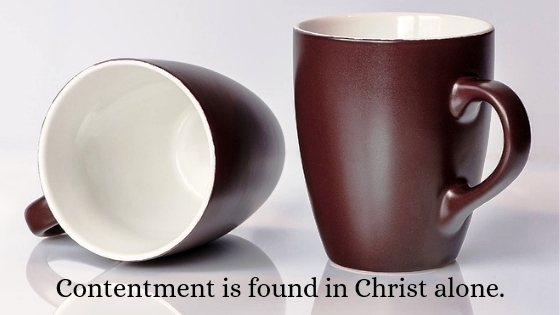 The closer we are pressed, the clearer His image is inscribed in our hearts as we grow more like Jesus. Each trial is designed such that Jesus will see us through it. He never leaves us alone and through our faith in Him, we overcome trials. In times of trials, let our prayers be for the asking of a renewed and strengthened spirit so there is nothing we can’t bear. The pain and troubles we go through are temporary and if we persevere in endurance with the spirit, the difficulties we face are nothing compared to the joy that awaits us (2 Corinthians 4:16-18). We will never learn what is in store for us and what we are really made of if we do not face these trials. An American author John A. Shedd once wrote, “A ship in harbor is safe, but that is not what ships are built for.” God has created us to be an overcomer and He is always faithful in His promises. There is nothing in this world that can trample us if we only believe and have faith in God. He has overcome the world and nothing can ever separate us from His love (Romans 8:38-39). When Jesus told Joshua not to be afraid of the enemies for they have already been given into his hand and that no one of them are able to withstand him (Joshua 10:8), God is literally speaking about the enemies that Joshua and his army will be facing in every war there is. To us, the present day Christians, this “enemies” figuratively mean the trials that we have to face. God has already given them into our hands through our faith in Him and he who has faith in God overcomes the world! Many people in the Bible have experienced the hands of God through faith by whom anyone can be inspired. 1) Noah and the Great Flood. Noah was instructed to build a huge ship in preparation for the great flood when there was no sign that it would rain at all. But Noah believed God and put his trust in Him, so his family and every kind of animal has been saved from the floods. 2) Abraham, by faith never doubted God’s promises. He was willing to offer Isaac as a sacrifice, believing God will raise him up from the dead (Genesis 15:6; Romans 4:3), for God has promised him earlier that through Isaac he will become the father of many nations. 3) Sarah who by faith was enabled to bear a child at an old age (Romans 10:10). Sarah remained faithful and believed God’s promise of an heir. 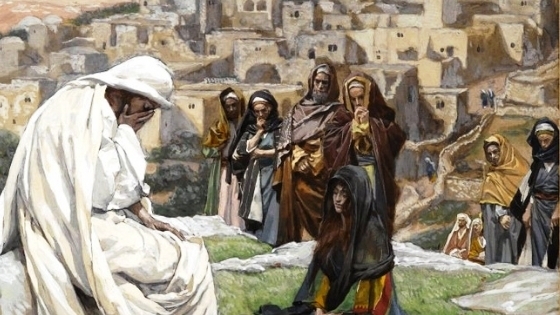 For 25 years, she and her husband Abraham waited and indeed, she bore a son in the most unfavorable situation anyone could ever imagine, that is, being old and barren. 4) The Centurion’s faith in Matthew 8:8-13, was described by Jesus Himself as the kind of faith that He never saw existed in all Israel. The centurion needed not more that Jesus’ words to believe that his servant is healed. 5) The people, who by faith, crossed the Red Sea on dry land (Exodus 14:15-16; 21-22). The people were being chased by the Egyptian soldiers from behind and they are approaching a huge body of water, the Red Sea. God promised Moses that by his leadership and God’s blessings, they will escape from the hands of the Egyptians, and by faith, they were able to cross the Red Sea on dry land. F – Fulfillment (Philippians 4:11-12). Under any circumstance, faith brings forth fulfillment in life. 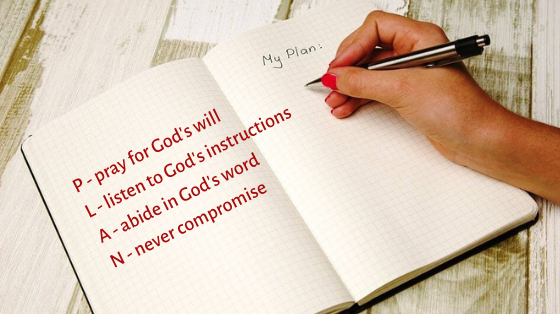 A – Assurance (Ephesians 2:8-9). There is nothing more secured than the assurance that we have received by putting our faith in God. It is because of His love and grace for us, that He gave His only one begotten Son, that whosoever believes in Him shall not perish but have everlasting life (John 3:16). I – Impossible (Matthew 19:26 and Hebrews 11:6). It is impossible for man but for God, nothing is impossible. We need only to believe because without faith, it is impossible to please God. T – Trust (Isaiah 26:3). We can have perfect peace if we only put our trust in God. H – Hope (Romans 4:18-19). By faith, we see hope in hopelessness. In ending, it is by God’s grace through our faith that we experience the greatness of God’s works in our lives. In the midst of difficulties that we encounter in life, let us put our trust and faith in God the way Abraham, Moses, Noah and many more did. Let us use the examples of Joshua and Caleb who focused more on the positive side of the news rather than on the inconveniences from its negative side. For it is only in believing and putting our trust in God that we receive the gift of salvation. Through faith, we can overcome the world with Him and live a victorious life even while we are still here on earth. 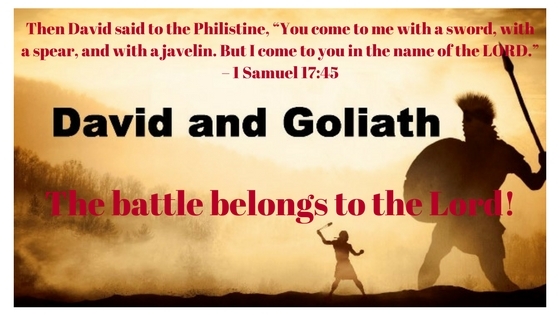 A few years ago, I have talked about how David bravely fought Goliath, the Philistine giant of Gath (1 Samuel 17). Focused on the great battle, I have paid no attention on the stones that David brought with him that day. Going back through the same Scriptures today, I pondered on the five stones that the young David brought with him. If David was so certain he could kill Goliath with just one stone, why then the other four stones? 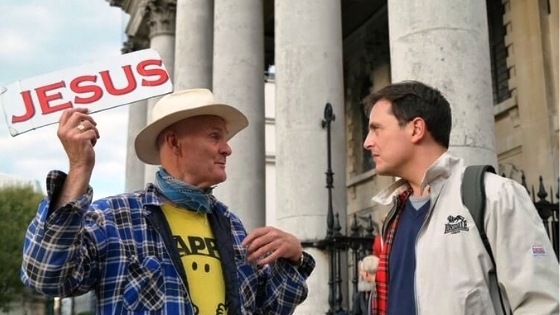 Had David doubted if God was really on his side? Others say that David was equipping himself in case the other four giant siblings of Goliath will step forward in retaliation if big brother gets defeated. Yet, some say that David was simply preparing in case the Philistines assault him in support for Goliath. The latter invites more skepticism than clarity on how David was thinking to fight against an army with the remaining four stones. The Bible however, does not explicitly narrate why David had brought more than one stone with him, specifically five in numbers. With any of the above reasons, David nonetheless, carefully handpicked each stone from the brook and must have chosen those that were sound and round to make perfect ammunition. The stones are anyway his only weapons. It was written that Goliath challenged the armies of Israel repeatedly for forty days and nights. If someone is brought forward to fight against Goliath and kill him, then they will be their servants. On the other side of the coin, if Goliath prevails against David, the people of Israel will be their servants (1 Samuel 17:9). Saul and all Israel were dismayed and afraid upon hearing this because Goliath is so tall, mighty, and was having the physique of a seasoned experienced soldier designed to kill and to conquer (1 Samuel 17:11). Who will by any other reason not fear a vicious giant? Saul and the rest of the Israelite army were terrified and certainly losing hope. David was then a young shepherd who was made to run errands. Being the youngest among his siblings and inexperienced in war, David was sent by his father, Jesse in between feeding his father’s sheep back home and taking care of the needs of his three elder brothers who were in the battle camp (1 Samuel 17:15-18). Eliab, Abinadab and Shammah, were fighting in the front line against the Philistines. It came to pass that one day, while David was checking on his elder brothers as instructed by his father Jesse, he over-heard Goliath’s challenge while the Israelites warriors were turning back with great fear. David expressed his protest from what he has heard and this had reached the attention of Saul. At this point, as the encounter between the young David and the villain Goliath is about to begin, let us name the stones not by their physical features but by the good element that each one would have represented. The battle was not actually between the Philistines and the children of Israel but the battle is the Lord’s (1 Samuel 17:47). David believed the outlandish in the minds of men. By heart, he trusted that the Lord who delivered him from the paw of the lion and the bear from whom he protected his father’s sheep against, will deliver him as well from the hands of this Philistine (1 Samuel 17:37). Inexperienced, young and armed only with a sling and five stones, David depended more on his faith in God rather than on the things he had as his weapon. David knew that he was not fighting his own battle but the Lord’s. With fullness of trust in God, he loaded his sling with the stone, and ran with all his strength towards Goliath. David needed to launch only a single stone to defeat Goliath (1 Samuel 17:50). Along with that stone is his full trust and faith in God (1 Samuel 17:45-46). The Lord will never fail those who trust and believe in Him! The young David is a true example of an inexperienced but brave warrior. In contrary with the rest of the Israelite armies, Goliath never intimidated him. With his comparatively weaker and ruddy appearance, David certainly seems to be the least favorite bet in this fight. Armed with only a sling and five stones against a giant armored with bronze helmet, coat of mail, bronze armor on his legs and a bronze javelin between his shoulders (1 Samuel 17:5-6), David knew so well where he needs to get his courage from. God bestowed on him a pure heart where all his courage nested. David won the victory with just one stone of faith but he was armed with courage as well! How do you go about in dealing with Goliaths in your life? Do you have the same fortitude just like David had? Well, it takes a genuine faith in God to keep courage brewing in your heart. If God is for us, who can be against us (Romans 8:31)? Going back a few scenes of what took place that day, in preparation for the battle, Saul geared up David with his own armor, helmet and a coat of mail. David fastened his sword to his armor but he took them off after he tried to walk. David took them off not because he thought that he did not need them; neither because they did not fit him. David took them off saying he cannot walk with them on him because he had not tested them (1 Samuel 17:38). 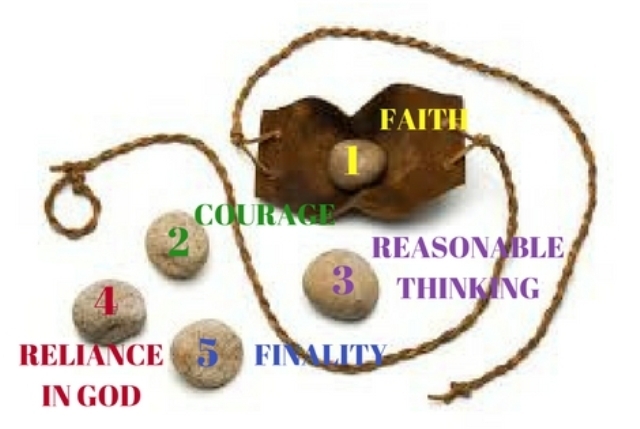 Here goes the third stone that David had; the stone of reasonable thinking. It was either David’s innocence or his determination to win this fight that did not make him settle for anything excessive or anything less than what he was sure of. Either way, he got around from creating a probable problem resulting from his inexperience. He was not comfortable with all that stuffy armor and sword but would rather use what he is very well familiar with, his sling. David was not armed with faith and courage alone, but with a reasonable thinking too. How do we battle against our own Goliaths? Do we use our reasonable thinking in wrestling against them? Do we conform to the things of this world in getting over our Goliaths even if we know that these are not fitting in the eyes of the Lord? Not everything acceptable in this world is pleasing to God. We have to use our reasonable thinking in dealing with our problems. Perhaps anyone who was about to face a great battle would feel secure being armed with completeness of the must-have stuff of a warrior. David’s experience of being protected by God in fighting against a lion and a bear that took a lamb from his father’s flock brought him in total reliance to God’s grace. He has his full trust in God rather than on the King’s heavy armor of steel and sword. His faith, courage, reasonable thinking and total reliance in God paved his way to victory. When we face our Goliaths, do we rely more on the weapons made by man instead of total reliance in God’s loving kindness and divine protection? Weak as we are, we trust more on the things we can see and touch instead of trusting on the Almighty. David prevailed in the fight. With a single stone slung and struck, the giant fell to the ground. He did not leave his task unfinished. David stood over the fallen giant, took his sword, drew it out of its sheath and cut off the giant’s head (1 Samuel 17:50-51). Whenever we face our Goliaths, we do not stop halfway to victory. We thrust in the whole armor of God, crashing down and finishing our Philistine giants (Ephesians 6:12-13). In the story of David, we were taught that it takes faith, courage, wit but reasonable thinking, total reliance in God and finality in our own battles against the trials and challenges we face in our daily life, to win the victory. We should not look at how big or how difficult the challenge is ahead of us. Rather, we must focus on the author and finisher of our faith, who for the joy set before Him despised the shame and endured the cross (Hebrews 12:2). If God is for us, we are more than conquerors through Him who loved us (Romans 8:37-39). Have a victorious life with Jesus! *** For a complete list of various Bible translations, study guides and reference materials, music, toys, gifts and many more at very affordable prices, visit Christian Book Distributors. Prayer is the lifeblood of a Christian life, it sustains our walk with Jesus. While every Christian has his unique prayer lifestyle, prayers differ in quality from one another depending on the depth of our personal relationship with Jesus. However, without particularity, if we consistently soak into deeper experiences of a sincere prayerful life, the Holy Spirit not only empowers us in our prayers but in our whole Christian life. Through our earnest and unceasing prayers, we unleash tons of endless adoration, confessions, thanksgiving and supplications. Apparently, there is really nothing wrong in praying for oneself because in fact, the Bible teaches us to nourish and cherish our self, just as the Lord does the church (Ephesians 5:29). However, it is our unceasing perseverance in praying for others that aligns us with God’s will of a far-reaching and matured Christian prayerful life. It is in an intercessory prayer where we lift supplications and thanksgiving for others to God. It is transiently forgetting oneself and pleading to God for others. While we tend to show our support in prayer for our friends and others, we shall also be cautious with the words that we speak. 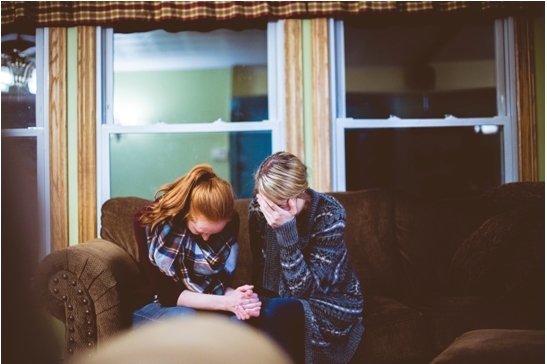 When comforting those who are going through trials and frustrations, it will be sensibly better to refrain from saying, “I will pray for you” if you really cannot or do not actually intend to do so. Saying those words of encouragement may lighten the conversation at the moment but it turns up that it’s an empty statement if it was just said without sincerity. You have failed not only your friend but above all, you have failed God by with-holding His power from administering in the life of your friend. Remember that saying the right words with sincerity is like offering gold on a silver platter (Proverbs 25:11). In the Old Testament times, the Levitical or Aaronic priests are the mediators between God and man. Under the Mosaic Law, Aaron and his sons were ordained to perform the priestly duties in the holy tabernacle (Exodus 28:1-3). They intercede for the people and are the only ones permitted to enter the holiest place. They assist in burning and offering sacrifices for the atonement of their own sins and for the sins of others. Their priesthood is passed on exclusively within the tribe of the Levites. 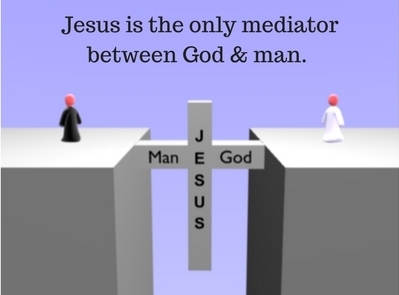 Under the New Testament, Jesus is the only high priest forever in the order of Melchizedek (Hebrews 7:17; Hebrews 4:14 and Psalm 110:4). His holy priesthood is fitted only for the righteous King. Jesus is our intercessor then, now and forever (Hebrews 7:25). He has been the offering once and for all, for the atonement of our sins. Jesus died and He has risen in resurrection for the salvation of mankind, our great priest, the only mediator between God and man (1 Timothy 2:5). He is the way, the truth and the life. No one comes to the Father except through Him (John 14:6). Through His death and resurrection, He has clothed us with His robe of righteousness (Isaiah 61:10), and He has chosen our generation, a royal priesthood, a Holy nation, and His own special people (1 Peter 2:9). As Jesus’ followers today, we offer ourselves as a living sacrifice, holy and acceptable to God (Romans 12:1). Who must be praying for whom? In the first letter of the Apostle Paul to Timothy, he encourages the Christians of the church in Ephesus that supplications, prayers, intercessions, and giving of thanks be made for all men, for kings and all who are in authority. Praying for others is an important sacrificial ministry introduced to us by Jesus Himself (John 17:1-26). Invitations for intercessory prayer are often announced in churches, only to be ignored by many. Most, if not all members of the church shrug their shoulders in apology, taking it as an invitation intended exclusively for the so called “prayer warriors.” Is everyone not a prayer warrior? Anyone who from his heart believes that God does answer prayers would be an intercessor, an effective prayer warrior, if he wills. Following the steps of Jesus, we too are ordained to pray for all men. When it is written “for all men,” it means we need to pray universally not only for our friends and relatives but we must pray for our enemies too. We pray for those who curse and persecute us (Matthew 5:44). Would God hear our prayers of destruction for our enemies? Certainly not! God in all His goodness will rebuke such desire and prayer (Luke 9:53-56). We need to pray for and in submission to the authority of our community and church leaders whom God has appointed to lead us (Romans 13:1). God directs the hearts of them that He appoints (Proverbs 21:1). Let us pray for God’s wisdom to be upon them, that we may lead a quiet and a peaceful life. Our leaders need our prayers for enlightenment and direction. For it is written that a blind man cannot lead the blind (Luke 6:39, see also Matthew 15:14). Why do we intercede for others? Different people have different motives in praying for others and in some cases, naively demeaning the powers of the one true God. As an example, some people say that they pray for others to generously help God as He works in answering prayers. When intercessory prayers are answered, they boast of being part of the process. They are sometimes subtly slow in remembering that God knows the thoughts and plans that He has for everyone (Jeremiah 29:11). In His Divinity, He does not need our contribution to make what He thinks is appropriate to happen. Remember that apart from God; we cannot do anything (John 15:5). With or without us, God He can make things happen, according to His will from eternity (Isaiah 14:24). Similarly, in His gift of Salvation, man’s only contribution is sin. More so, some of us pray for others with the hope of fast-tracking God’s answers. 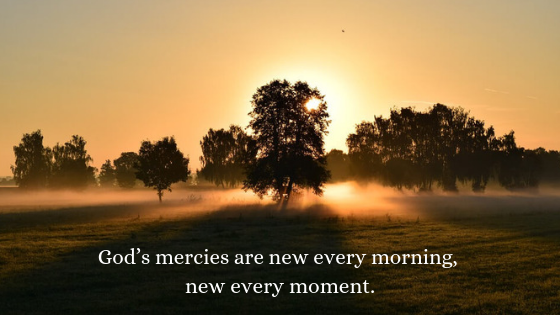 Have we forgotten that God answers prayers in his own time (Isaiah 65:24)? Do we know better than Him as to when He has to answer our prayers? In many other instances, we seem to show we care for others. In times, they pray the least, we heroically step-in interceding, with thoughts of covering-up for them. Is God just like one of us who plays the games we play? There should be nothing such as deliberate delegation of prayer. Neither is there prayer by substitution. What then is the righteous motive in praying for others? Praying for others should have the very basic reason of loving others. Second to loving God with all our heart, with all our soul and with all our mind, is His commandment to love our neighbor as we love ourselves (Matthew 22:37-39). If we could only love others just how the commandment says we should, it follows that selflessly interceding for them is easy as praying for our own self. Moreover, glory is brought back to God where it belongs, with the praises of thanksgiving from many whose prayers in their behalf are answered (2 Corinthians 1:11). God does not change but the prayers of the righteous avail much. As we move around expectant hearts in prayer for others, a popular question of all times can’t be helped being prominent. Can (intercessory) prayers change the mind of God? Many will turn their lips mum on this simply because of not wanting to create chaos more than clarity. Setting argument aside, let us try to seek answers from the scriptures and not from our own intelligence. In Numbers 23:19; it is written that God is not man that He should lie, nor a son of man that He should repent. He will do as He has spoken to make it good. We learned that He is the same yesterday, today and forever (Hebrews 13:8) and with Him, there is no variation or shadow for turning (James 1:17). His essential being, Deity, character and attributes will never change. Change is the result of an addition, alteration or deduction. God has been, is and will forever be perfectly complete in Himself without a need to change. If He was made perfect only after the change, then His perfection doesn’t validate His nature being God. God does not need change while there is a lot of changing in us waiting to be done. Do the prayers of the righteous matter? God hears the prayers of the righteous and avail much (1 Peter 3:12, see also James 5:16). He knows what is there in the beginning and what will be there in the end. The prayers of the righteous touch the heart of our ever loving and merciful God. Because of his great love for us, He allows intermediate events to change in between the beginning and the end but works on things in alignment to the counsel of His will (Ephesians 1:11, see also Isaiah 46:10). Under any circumstances, if the response to our prayers that is appropriate within His Deity, calls for mercy, reformation, rebuke, punishment, blessings or for whatever the fulfillment of His promises would require, that is surely what He will do. Lastly, God is sovereign and His thoughts are not our thoughts. Our ways are not His ways. His thoughts and ways are higher than our own (Isaiah 55:8-9). Being such, there will and will always be questions left unanswered within the intelligence of man. If there is one question here not to be left unanswered, let it be asked within us. Do you love God and would obey His commandment to love your neighbor as yourself? If your answer here is a “Yes” just like mine, continue praying for others with love! *** For a list of hundreds of Bible translations, Christian resources and books, music, DVDs, toys, gift ideas and more at amazingly affordable prices, please Click here.